Today we started out with a trip to a secluded place about 30 mins. drive from town. It used to be a tourist attraction but people have forgotten about it over the years and as a historical site, has been a bit neglected. We went to a place called the Outdoor Palace. 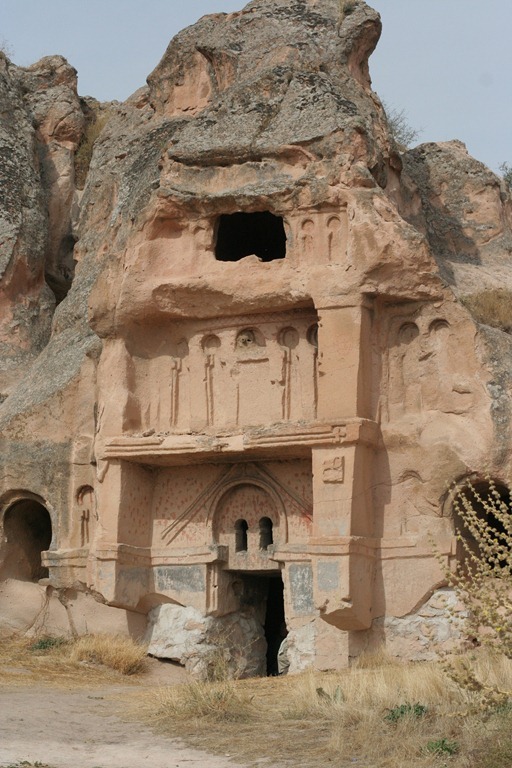 It is a 2nd Century rock-cut city where some of the earliest Christians settled. Our guide Feray reminded us that because the belief in the cross was not established until the 4th century, that the crosses we were seeing in the chapel areas were added later. We hiked a short ways to a look out spot to get a beautiful view of the surrounding area. After the Outdoor Palace, we visited an underground city. 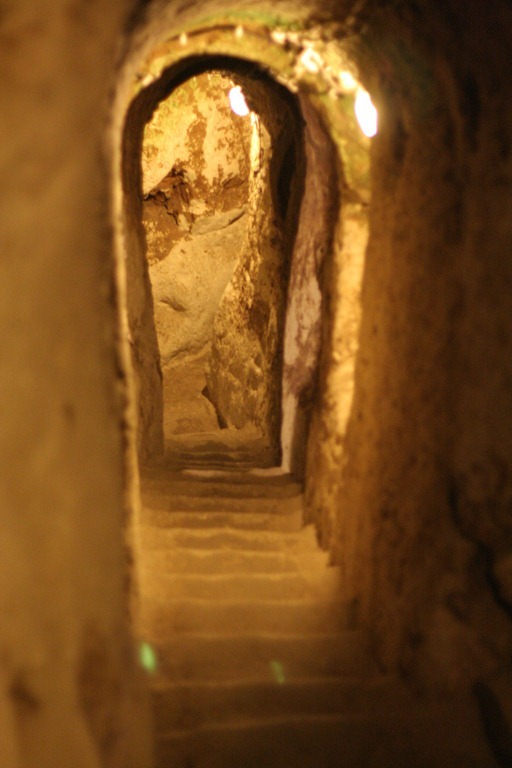 Although the practice of building cities underground dates back over 4,000 years, this city was build in the 7th century by the Hittites as protection from invading forces. This region is a plateau and since that offers them no protection by way of mountains or valleys, they build bunkers underground. The most interesting part for me, was the construction of the chimneys. Since they potentially would live underground for long periods during invasions, they inevitably would have to cook something. So, their chimneys were a serpentine design to disperse and defuse the smoke that arose from them. Innovation out of necessity. We headed to Goreme and had a delicious lunch a Sedef Restaurant. 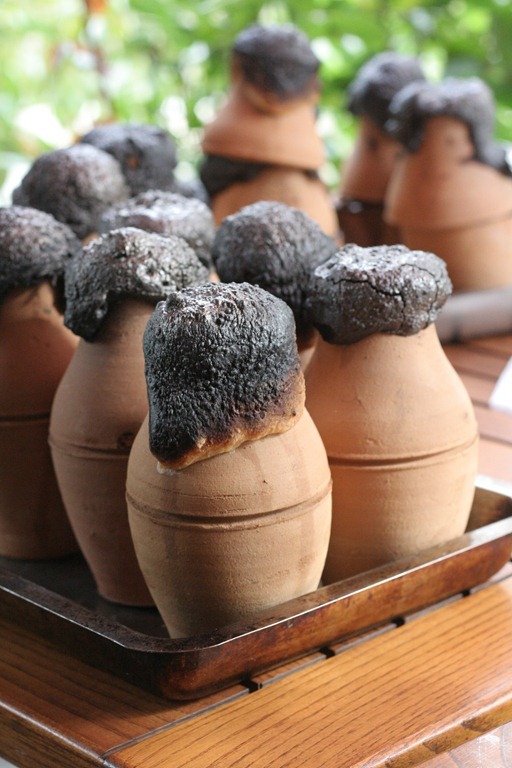 We had pottery kababs. 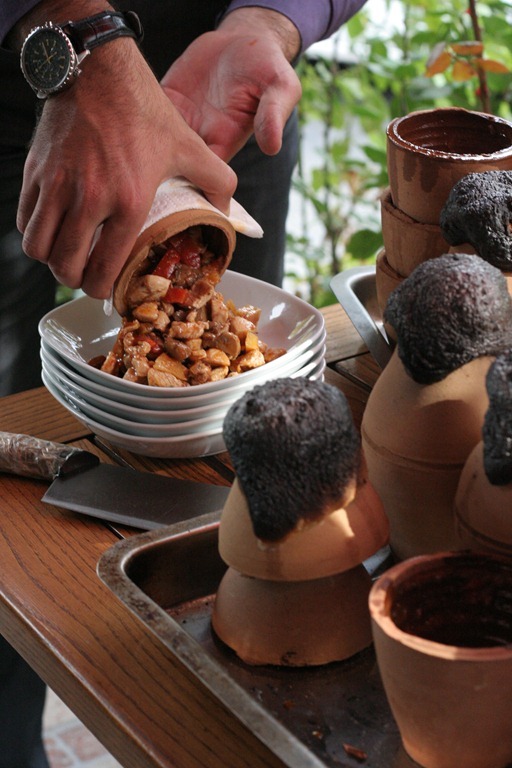 They are terra cotta pots stuffed with meats and veggies, then cooked in an oven for 4 hours. When the food is served they break the pot to get the food out. 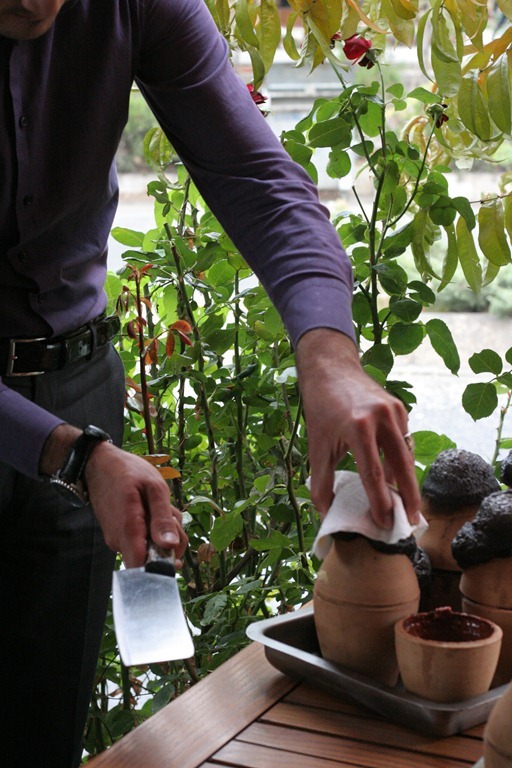 Some of the earthy clay is absorbed by the food during the cooking process and everything is very creamy and wonderful. It was the best food I’ve eaten on this trip (so far). After lunch we did some sight seeing around Goreme and the surrounding areas. We visited a carpet making factory and saw demonstrations of carpet weaving and silk thread production. Then we were given yet another opportunity to off load some cash. Very beautiful carpets and talented work. We headed back to town to gather our luggage and make it to the bus station by 8:00pm. We all called Derick to wish him a very Happy Birthday before we had to catch our over night bus to Antalya. Tomorrow we cruise!